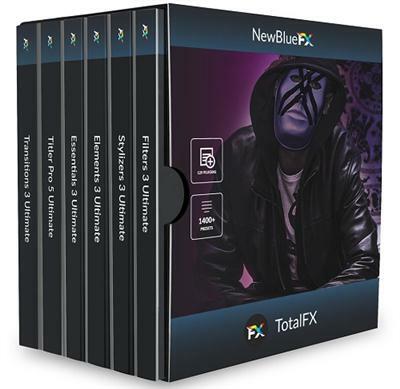 NewBlue TotalFX 5 delivers over 1400 presets in 129 plugins in our most comprehensive collection of titling, transitions and video effects.Includes the fully-featured Ultimate versions of our Elements, Essentials, Filters, Stylizers, Transitions and Titling lines. Now including Titler Pro 5 and Colorfast 2. TotalFX delivers it all for the serious video editor. "NewBlueFX TotalFX 5.0 build 170317 CE for OFX"
Bring your transitions to life with the over 400 presets in 37 plugins that provide a broad suite of cutting edge transitions. Use light, color and motion to deliver stunning, aesthetically fresh, scene-to-scene cuts.